Home » Blog » Bodyguard–The Saga continues…. Posted by cindy on Oct 10, 2009 in Blog | Comments Off on Bodyguard–The Saga continues…. There are sooo many decisions to make after deciding on the general concept, even if the piece is finished in my head. With Bodyguard, my original plan was to stamp a pattern on the girl’s shirt and have more detail in the bottom of the piece. But those details would have detracted from the focal point, the faces. So I opted to go with a solid tee shirt and keep things bold. 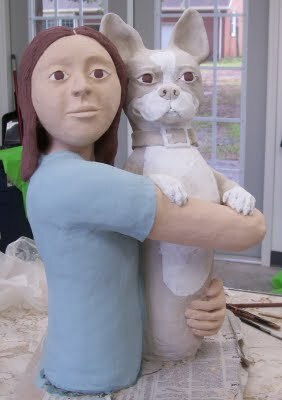 To minimize the number of firings, I decided to apply underglazes to the piece before it was fired. Bodyguard, the first layer of underglazes on the girl. 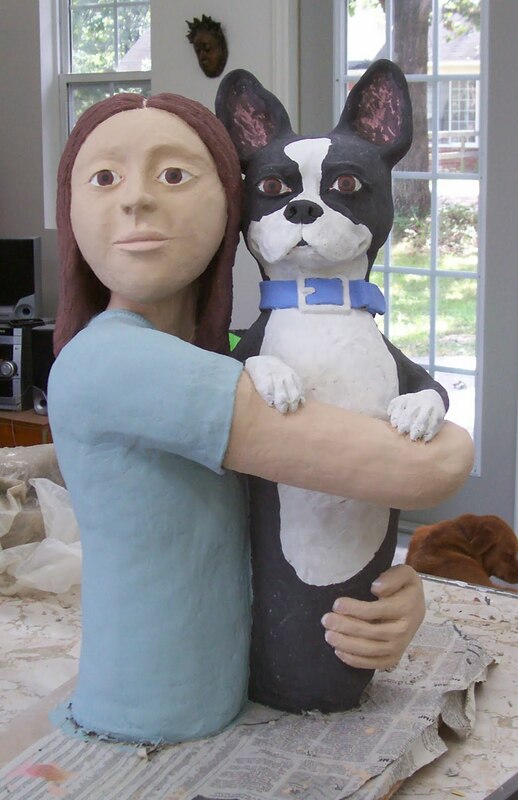 Bodyguard, the dog with underglazes. After firing, the colors will be close to what you see here. The girl’s skin will be a littler darker and her tee shirt a little brighter. I put one coat of underglaze on more area, so she may be blotchy. Some people can work on many pieces at once. I find that when I have tried that, the quality of all the pieces suffers and I end up being unhappy with the work and destroying it. I can, however, begin other pieces, as long as I focus on one at a time. As this piece neared completion, I started on the next two so they could start to firm up and be ready when I was. Stay tuned!